Executive Room: The accommodation in Executive Room with a Big Bay window offers a spectacular view of wide open valley and thick deodar forests. 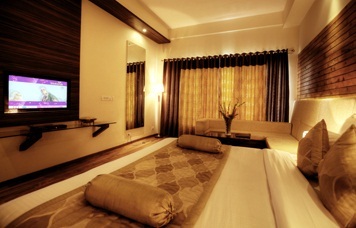 Executive Rooms are located on the third floor and offers the best view from the resort. 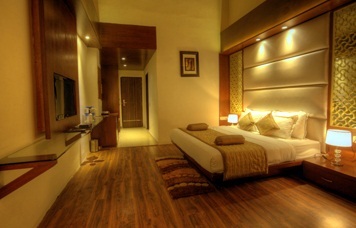 The Suites are with the Traditional wooden panelling exhibiting the traditional hill architecture, leatherette back, king size bed and Jali work on the back wall and sitting area. All the suites are air-conditioned and have broadband Internet access and WiFi, Tea/Coffee maker in each room, advanced telephone system, In room safe deposit box, 32″ LCD TV with satellite channels to watch with DVD players in each suite. Early arrival is subject to availability. For guaranteed early check-in, reservation needs to be made starting from the previous night. Late check-outs are available on request and subject to availability. A recent Government notification requires guests to present proof of identity at the time of check in. Guests are requested to carry with them the required document during their travel. Reservation must be cancelled 15 days prior to the planned date of arrival. 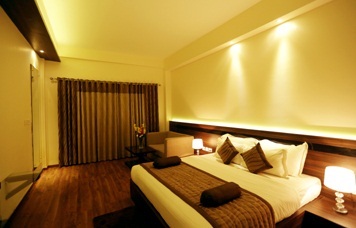 One night’s stay will be levied for cancellations received upto 8 days prior to arrival. Full stay will be levied for cancellations received within 7 days prior to arrival. Child below the age of 5 years is complimentary without extra bed and child in the age group of 6 to 11 years shall be chargeable RS.1050/- per Night.